This soup has been a Three Blue Ducks staple for yonks, something we all look forward to when the temperature drops. It has a lovely velvety consistency and good strong flavour, with a natural sweetness that comes from the peas. What takes it to the next level is mopping it up with freshly cooked garlic flatbreads. 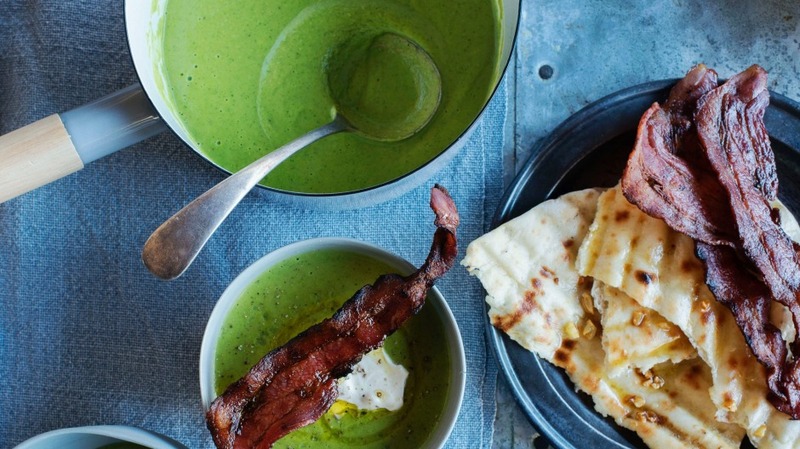 For the soup to stay a vibrant green, you need to serve it straight after pureeing. If you're making it before time, put it on ice as quickly as possible. Put a large saucepan on a high heat, add olive oil, onions, chilli and garlic and cook for 2-3 minutes or until onions are translucent. Cut eight of the bacon rashers into small strips, add to the pan and cook until the bacon is well browned. Add the chicken stock and bring to the boil. Add the frozen peas, and as soon as it comes to a simmer, add the mint. Let it simmer for one minute, then remove from the heat and blend to a fine puree. Season well with cracked pepper and flaked salt. Fry up the remaining four bacon rashers until nice and crispy. To serve, pour the soup into bowls, add a generous dollop of creme fraiche to each, drizzle with good quality olive oil and garnish with a crispy bacon rasher on top. Serve with the Three Blue Ducks garlic flatbread.